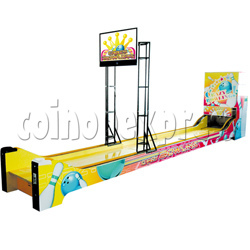 Crazy bowling is single arcade lane bowling machine designs for kids which delivers fast paced excitement of a real bowling alley. The coin operated machine completes with 32 inch LCD screen which showed the game and scores in sharp graphic animation and comes with sweet sound effect. It features in low stage design and bright colors decoration to suit children's height and taste, same small ball, kids easy to grasp it and play the game. It shall be a new favor of kids bowling lovers.